29 nutrients. To help maintain health & vitality. With vits B6, B12 & copper which support normal energy release for a hectic lifestyle. The Queen's Awards For Enterprise Innovation 2018. With 10µg Vit. D the level recommended by the UK Department of Health. Gluten free. No artificial colours. No preservatives or yeast. Wellman is not tested on animals. Suitable for vegetarians. UK's No1 for men* *UK's No1 men's supplement brand. 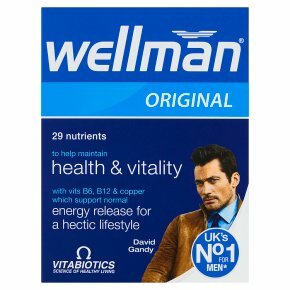 Expert support from Wellman® Wellman® has been developed to help maintain health in men of all ages. It is ideal for those with active and hectic lifestyles. Unlike a general multivitamin the nutrient levels have been specifically formulated for men. Hectic Lifestyle: With vitamin B6, B12 and copper which support normal energy release. Immune System: Includes vitamins C, D and B12 which contribute to normal immune system function. Sport & Exercise: To be on top of your game you can't afford to be tired. Provides pantothenic acid which helps to reduce tiredness and fatigue. Reproductive Health: Zinc contributes to normal reproduction and the maintenance of normal testosterone levels in the blood.